Who’s to say that new is better than old? Some people prefer antique custom cars, while others sport vintage clothing, and refurbished bicycles are all the rage these days—especially with a certain eclectic, hip crowd. 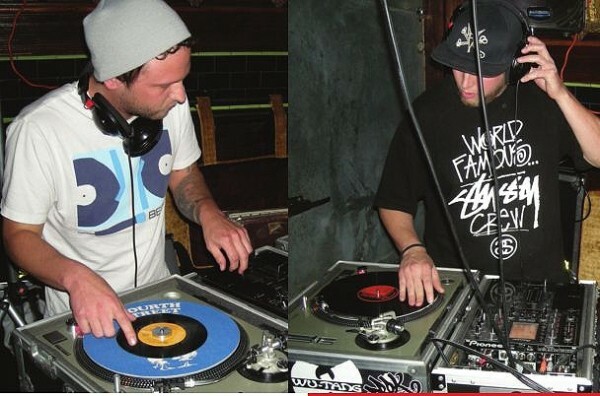 The DJ twosome of Chase Loter, aka DJ Chaseone 2, and Justin Godina, aka DJ Godina, have applied this concept to their own craft by ditching their laptops, along with their digital music libraries, and opting for a method rarely used anymore: spinning vinyl records. At one point in time, a vast collection of vinyl records was a necessity for a DJ to be relevant, but through the advancement of technology and development of DJ software such as Serato, records have become obsolete. This tool, basically DJing for dummies, makes searching through a library or finding a track with a specific beat per minute more efficient. So why would the DJ duo embrace this antiquated technique? The two DJ veterans have both been spinning turntables for more than 10 years. Chaseone 2 (2010 City Weekly Music Awards DJ of the Year) started DJing at 16 while attending high school in Phoenix. Godina has been DJing for 15 years locally and got his start playing house parties, until landing his first steady gig at Kristauf’s Martini Bar; now he’s at Maxwell’s East Coast Eatery in Salt Lake City on Fridays and Saturdays. The two met two years ago when Godina went into the Jackalope Lounge and saw Chaseone2 along with a few other DJs playing soul vinyl records. At the time, Godina had been spinning a vinyl disco-soul-funk set at Kristauf’s. “I met up with him and realized we were both kind of into the same stuff and started doing the collab on this night [vinyl Funk & Soul night, now at Bar-X on Mondays],” Godina says. “[Funk & Soul night] first began at Monk’s, and when Monk’s closed, we moved it to the Jackalope. We took off a few months and then started doing it [at The Garage],” Chaseone 2 says. The open music rotation both DJs speak of is apparent within 15 minutes of taking in their set, with songs such as “I Shot the Sheriff” (Bob Marley), “I Just Want to Celebrate” (Rare Earth) and “One More Chance” (Jackson 5). And if the range of music isn’t any indication to the immense amount of vinyl both DJs own, the two large crates filled with the stuff next to the turntables make it pretty evident. “I’m an over-bringer, because I like to have the possibility of being able to play some music requests,” Godina says, adding that, with 45s, he probably brings 400 records a night; Chaseone 2 says he brings 100 to 150. “That’s another draw for Serato: You don’t have to carry these crates out,” Godina says. But the additional labor of carrying in crates of records on top of their other DJ equipment is seen as worth the hassle, according to both DJs, even if there is a new, easy way of doing it.